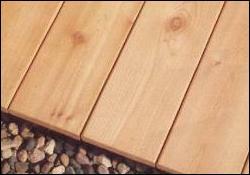 Taylor Sawmill has several decking options available. We manufacture 5/4" x 5" & 6" and 2" x 6" radius edge. Lengths are 8', 10' & 12' with the majority being 8' lengths, due to the natural taper of the White Cedar tree. Northern White Cedar lasts longer than Red Cedar. It is a natural alternative to pressure treated wood. Stain or preservative is not a must due to the natural resistance to rot.